After high school, students will no longer have a formal educational guide and must be able to be self-guided learners to continue their own professional growth. As a result, the development of agency skills while still in K-12 education is imperative. This article examines a study undertaken with 12th-grade government students to examine the connection between curriculum involving authentic-client based projects and the development of student agency skills. In particular, it examines the development of agency brought about specifically by the necessity of student innovation inherent in solving authentic problems. The study found that, with a focus group of students comfortable with Project Based Learning, that authentic client-based PBL requiring student innovation caused remarkable growth in both agency skill development and end-of-project content knowledge compared to growth from projects without an authentic client. In many ways, this video encapsulates the Theoretical Rationale of my project. My driving question was: ​How can authentic PBL products requiring student innovation be leveraged to help students develop agency skills? When considering the gamut of 21st century skills American students need mastery of in order to be successful in the international economy, the skills associated with student agency are arguably the most universally applicable. A sense of agency is obviously important, of course, in order to allow students to possess the skills necessary to engage in higher quality inquiry and exploration in the classroom, but helping students to develop the skills necessary to guide and persist in their own learning is central to the mandate of all teachers intent on preparing students for open-ended futures in the 21st century. Without a willingness to drive one’s own educational path, seek challenge, revise based on solicited feedback, grow from setbacks, and leverage relationships with others as collaborators and experts, students will lack the skills necessary to learn new skills or solve problems on their own. In short, producing a generation of graduates that prove they can do as they’re told in class will not mean they are also a generation that are prepared for the demands of life in the 21st century. The development of agency skills is not necessarily a new expectation, though in some ways the movement toward agency as a deliberate learning outcome is. In classrooms where agency is valued and assessed, skilled teachers approach it by providing structured opportunities to practice the skills, similarly to how they would teach any other content standard or skillset. The problem with this method is that agency skills are meaningless without context. As has been seen in other relatively half-baked comprehensive school reform plans, teaching students to practice new skills without understanding or experience of an authentic context refuses them the opportunity to learn the appropriate usages of the new skills (Bozac, Vega, McCaslin, and Good 2004). Considering the need for authentic context, then, causes the issue at hand to revolve around defining what an authentic context would look like. Simply put, people who are successful as a result of persistence in the face of adversity or a drive to improve based on feedback do so because they saw no other alternative to success. People don’t put forth effort to seek knowledge if the knowledge is readily available. One doesn’t seek challenges if easy solutions exist. A person has no drive to get feedback if the expectations of the task at hand are simple and easy to meet. Innovation, therefore, is a possible option for an authentic context for agency development. The theoretical framework for this study is rooted in Ryan and Deci’s (2000) work around the concept of intrinsic and extrinsic motivation. They start by pointing to the previously understood differences between intrinsic and extrinsic motivation. Intrinsic motivation is generally defined by a person completing a task because of the inherently rewarding nature of completing the task. An externally motivating task is generally one that is completed for rewards given from elsewhere (money, grades, praise, etc). Of particular interest to this study is the reminder that intrinsic motivation tends to result in higher rates of deeper learning and manifestation of creativity. Ryan and Deci remind us that intrinsic motivation is foundational to human development due to its role in early childhood exploration. Additionally, Ariely, Gneezy, Loewenstein and Mazar (2005) and their work on motivation points out that intrinsic motivation improves processes of creativity while extrinsic motivation actually works to retard creativity. Deci and Ryan (1985) continue by referencing their previous work on Self-Determination Theory. Self-Determination Theory starts by asserting that people are generally motivated to keep levels of stimulation as high as possible. In an attempt to continue high levels of stimulation, people do have the ability to behave agentically when given the appropriate kinds of external motivation. If a student understands the value and importance of an externally given task, and they are allowed opportunities for volition, the completion of the task can grow to be self-endorsed and thus the student will develop intrinsic-like motivation for the task (Ryan and Deci 2000). This, of course, is good news for teachers, who rely heavily on externally assigned tasks. 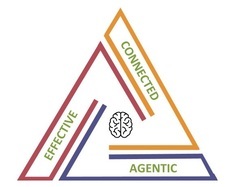 They found, however, that all three characteristics must exist together; if taken separately, students will not develop the same levels of intrinsic motivation. The last piece of literature related to the theoretical framework is the determination that manifestation of agency skills has more to do with behavior than personally held characteristics (Van Lier 2008). Agency skills, therefore, can be nurtured as with any other academic skill. The structures in place, however, must always balance with a student’s motivation in order to be successful (Toshalis and Nakkula 2012).